In the fitness industry, the customers and clients are what make you money, and it all comes down to the community you surround yourself with. Whether you run a gym, sell supplements or run a blog with personal training tips and techniques, building an online presence is key, forcing you to understand the intricacies of areas like SEO, web design, and more. And fitness WordPress themes can help with all of that. That’s why we want to cover the best fitness themes here today. But before we get to that, let’s talk about the benefits. What Do Fitness Themes Offer? Fitness themes make it easy for gyms and other fitness businesses throughout the world to reach out to new customers, helping people become healthier and more confident with their own bodies. But beyond that, they come with unique features that make it possible to build a site quickly and with relevant attributes for fitness enthusiasts. I’m talking about things like BMI calculators, event schedules, appointment booking, and more. Could I Build a Site Myself? If you have the web design chops, of course. But if you don’t, building a gym or fitness site from scratch would be a lot of effort and chances are good it wouldn’t look nearly as nice as one of the themes we’ve collected here. In short, unless you’re an experienced designer and developer already, skip the hassle and pick a fitness theme that fits the bill instead. Keep reading to learn about the top fitness themes currently available. 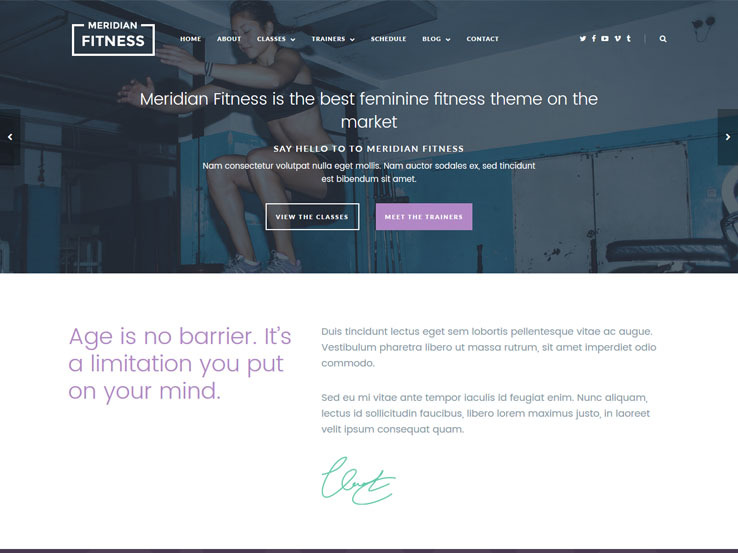 Meridian Fitness is a responsive WordPress theme best suited for gyms, yoga studios, sports, and pretty much any type of sports or fitness website. However, thanks to the numerous customization and layout options, you can easily adapt it to suit your niche and your website needs. 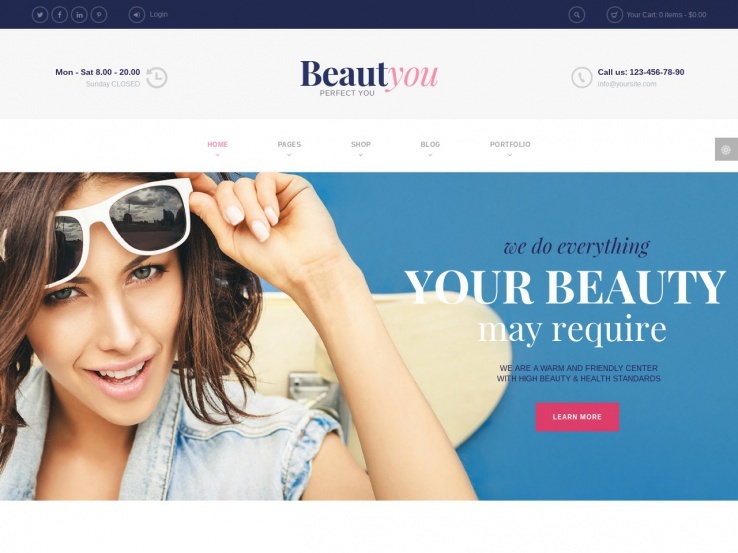 The theme comes with a one-click demo import which gives you a head start in your design. Custom page templates are also included, allowing you to add a class page, a trainer page, and a schedule page. The theme incorporates a parallax effect to add smooth transitions without slowing down your website. Customize the colors, add custom fonts, change the layouts, and you can rest assured your website will look great on any device thanks to the responsive design. On top of that, the theme comes with extensive customization and premium support should you need any help along the way. The CSSIngiter company considers Olympic the “Arnold” of themes, and it’s certainly a strong contender for those who are interested in a functional and stylish fitness theme. The Olympic theme provides a beautiful events calendar plugin for booking special training sessions and showing people when classes are being held at your gym. Choose from four content types to add variety and provide more content to your clients. Custom widgets are helpful as well and flexible layout options ensure that you can incorporate your brand and add your logo as well as your training galleries. Display your working hours, staff, contact information and services, without changing much from the default layout. 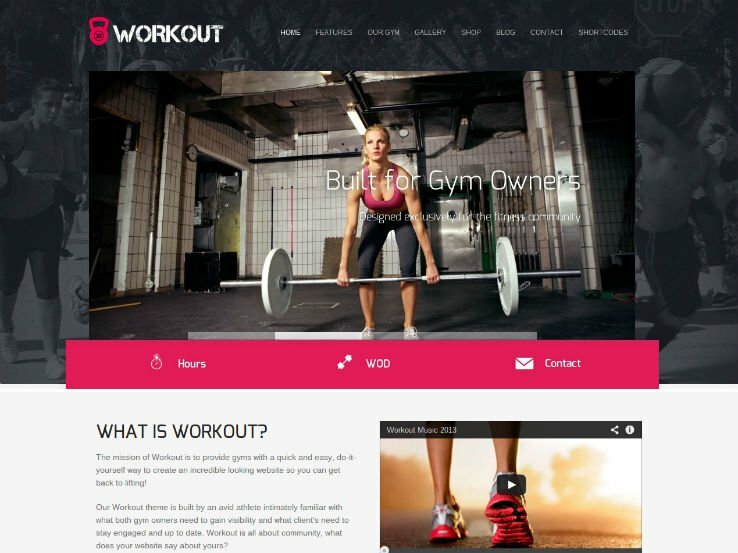 Workout – A Responsive WordPress Gym Theme is a responsive theme for gyms and personal trainers. Custom post types include options for quick schedule creation and lists for your programs. Not only that, but you can create posts to highlight your coaches, show off your testimonials, and even notify people about any of your upcoming specials. The theme includes pre-built page templates and face-recognition cropping cuts down on the time you spend making your staff’s pictures look wonderful. Implement a WooCommerce shop to start selling products through the site, and try out multiple sliders and footers for additional information. 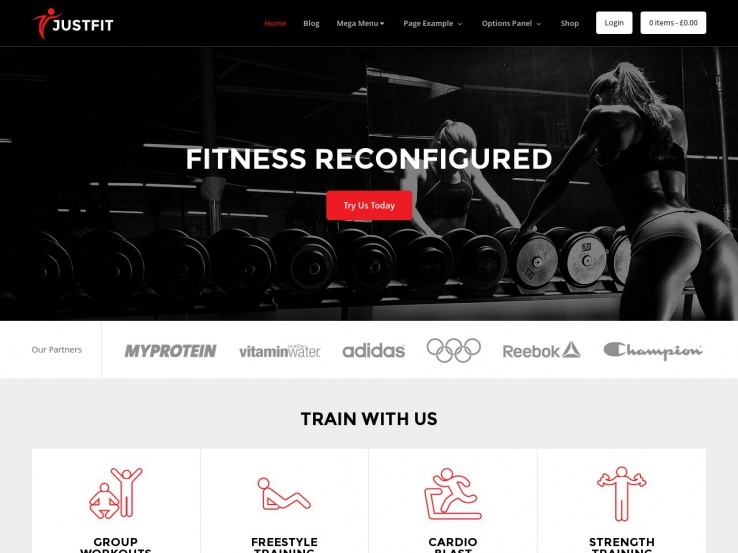 The JustFit theme is a fully responsive theme for gyms, trainers, and workout junkies. The theme loads very fast so that your customers never have to wait around to see your content. The powerful theme options panel is easy to use regardless if you’re a beginner or advanced user, and the AdSense optimization allows you to easily add GoogleAdSense ads and monetize your website. The drag-and-drop editing section is ideal for people who don’t have much development experience and the slider section works wonders for displaying specials and other promotions. Parallax scrolling provides an interesting way to grab the attention of your visitors on your site, and this effect goes quite well with fitness images. 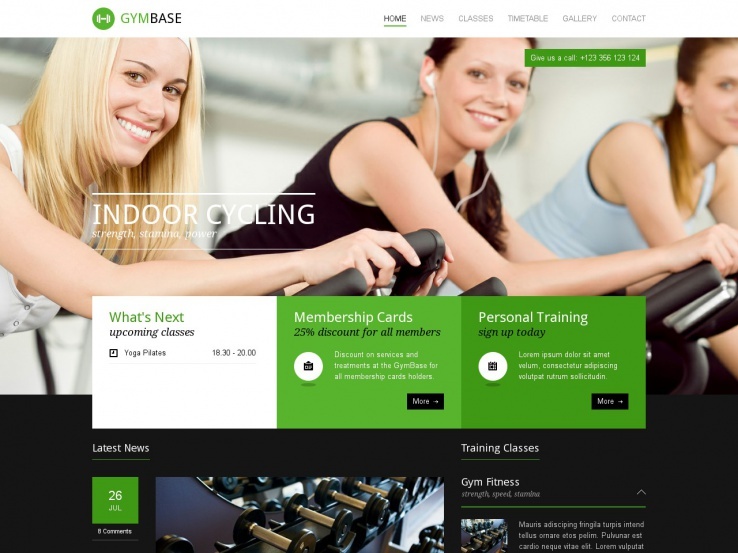 The GymBase theme has a responsive layout, with fun and bright colors to show off your unique style. The drag-and-drop Visual Composer page builder is just what you need if you have never experienced web development before. It allows you to manipulate the layout without having to know the code. More than 50 page builder components allow you to add anything from single images to nested accordions. Use the dummy import content so you don’t have to start your design from scratch, and try out the built-in responsive timetable to give your customers an easy way of available classes so they can sign up for the class that fits into their schedule. 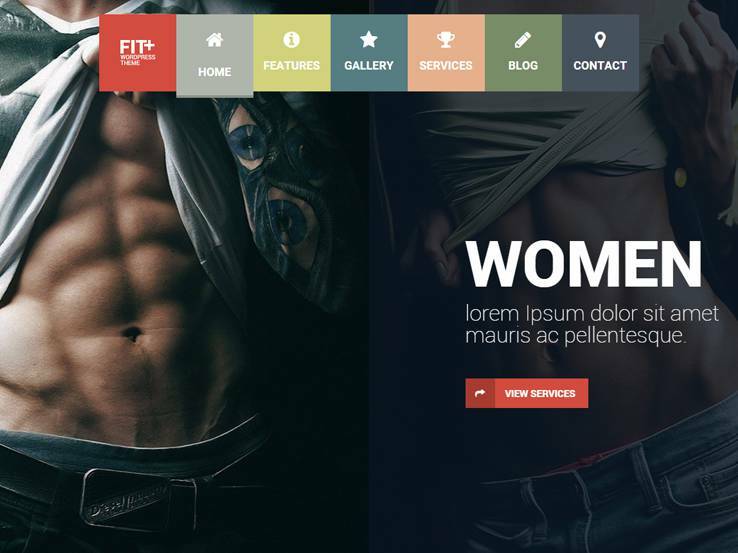 The Fit+ theme has a strong design, with powerful characteristics to get people motivated about working out and staying healthy. The homepage offers a unique layout allowing both men and women to access workout programs designed specifically them with a click of a button. The navigation menu is colorful and makes it easy to browse your website. The Slider Revolution plugin is included with your purchase and the video background is one of the easiest ways to grab the attention of your visitors, showing off videos of your clients working out. 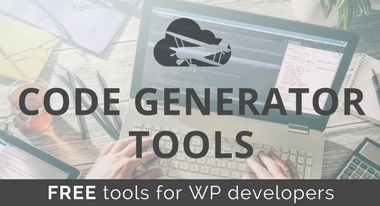 The GT3 Page Builder plugin is ideal for keeping your hands free of source code, and the full-screen blog ensures that you can easily grow your audience and boost your search engine ranking by sharing workout tips and tricks. The Dream Spa theme has a clean and elegant design with a mega menu that allows you to add all your pages without cluttering the navigation bar. Your contact information is clearly visible at the top which makes it easy for potential clients to get in touch with you and book a treatment. A shop page is included for selling your own merchandise and you can display various treatments you have available as well as clients’ testimonials on the homepage. Feel free to change the theme’s skin to better match your brand and include an email signup form that integrates with MailChimp to grow your email list. One click demo install means you never have to start your design from scratch. The visual shortcode builder ensures that you don’t need to mess around with the source code to add elements like buttons and columns. Gym Extream sounds like an extreme theme, and it doesn’t disappoint. 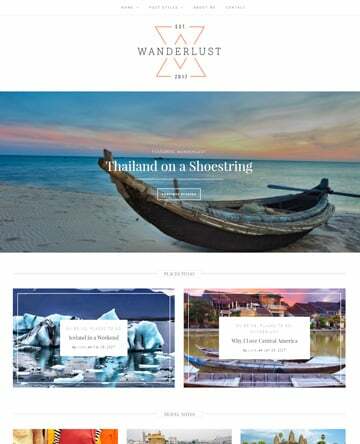 The theme includes drop down navigational menu with three levels, allowing for deep linking and numerous pages and posts. PSD Files are included with your purchase, so advanced developers can modify any aspect of the theme. 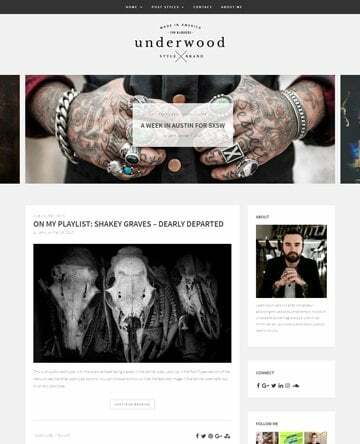 The theme looks bold, with strong colors, interesting fonts, and cool spots to place your photos. Along with the theme comes an event management system for displaying your classes and other events, which also allows visitors to sign up for the events. The theme includes eight color variations, which makes it a little easier to select a combination that fits their own brand. 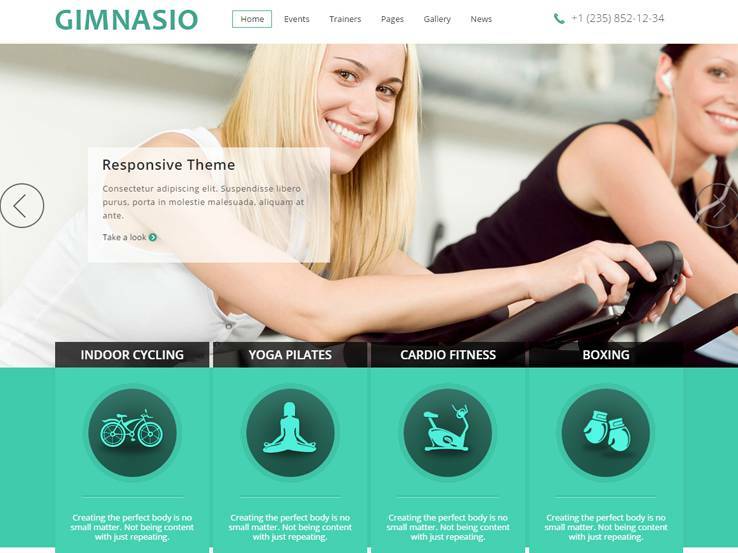 Consider the Gimnasio WordPress theme if you require a responsive website with tons of media. 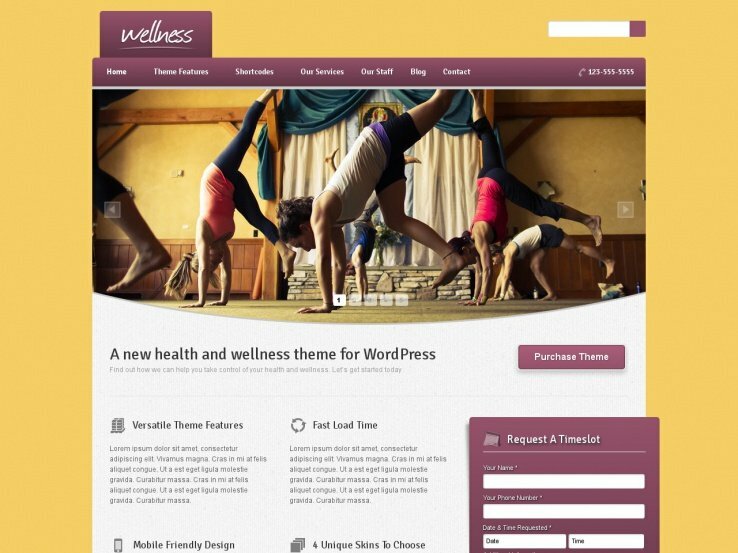 This theme is primarily used for fitness centers, but yoga studios and other companies have can benefit from it. The Gimnasio theme provides a wide screen slider for displaying your best content or special promotions and the slider even has an area for overlaying text that can be used as a call to action. Select from various typography solutions and share pages for your trainers, events, and photos. Several shortcodes are included so you can easily add elements such as maps, dividers, and columns. Use custom widgets to add content to your sidebar and display your contact information, upcoming news, and a spot for your newsletter signup. 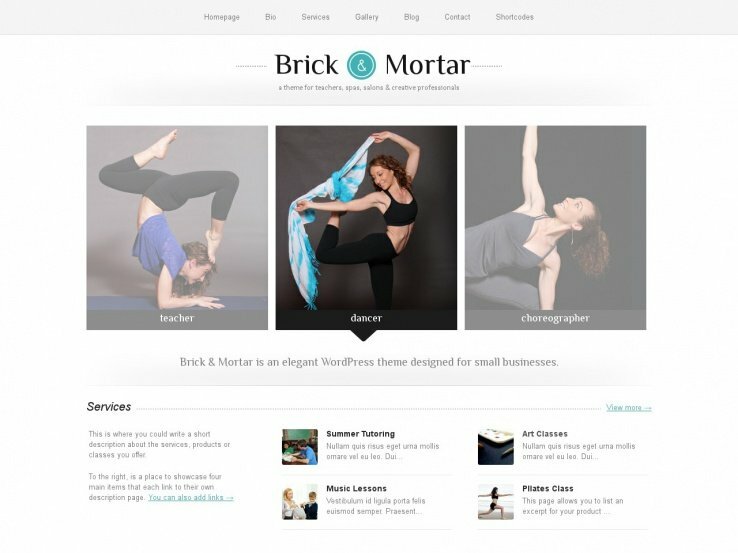 Brick & Mortar – a personal business theme is geared for creative professionals, but it works wonders for fitness blogs and gyms that want a modern touch, with loads of functionality. Choose between two homepage slider styles, and consider implementing the multi-pricing product or service page to add additional monetization methods to your website. Localization support is a plus if you want to reach an international audience. A notable feature is the ability to change what your gallery looks like since it comes with three varying styles, each of which looks quite beautiful with fitness photos. Place your services and products in list format and use all of the custom widgets to add different content without the need to touch a single line of code. Brick & Mortar has a default contact form that comes with your purchase. This way, you don’t need an additional third-party contact form plugin that may bog down your site. 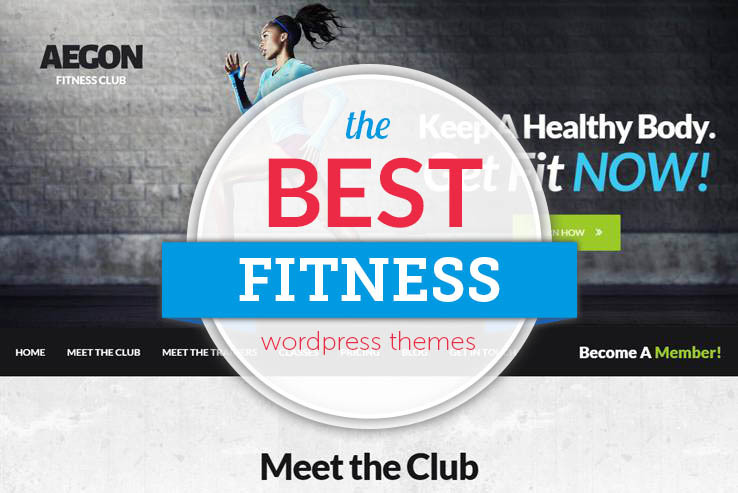 The Wellness WordPress theme is a beautiful choice for fitness clubs and personal trainers who want a modern and professional website since it offers four health and wellness skins to choose from, along with a cool customizer that allows you to change the color scheme for your website. The responsive nature of the Wellness theme means that anyone can open your website on a mobile device (tablet or phone) and still be able to successfully read your content. The theme options panel is beautifully designed, making it easy for both beginners and advanced users to make the changes required. A responsive slider is a great tool for showcasing specials, promotions, and upcoming events. Wellness is completely translation-ready, allowing you to translate your website into any language you want. The theme is also SEO ready which means search engines will be able to index your website properly. The four skins are the most notable feature for the Wellness theme and they include Classic Medical, Pastel Sunshine, Forest Retreat, and a skin called The Beach. Wellness offers an eye-catching request form, which helps you manage your appointments straight from your website. 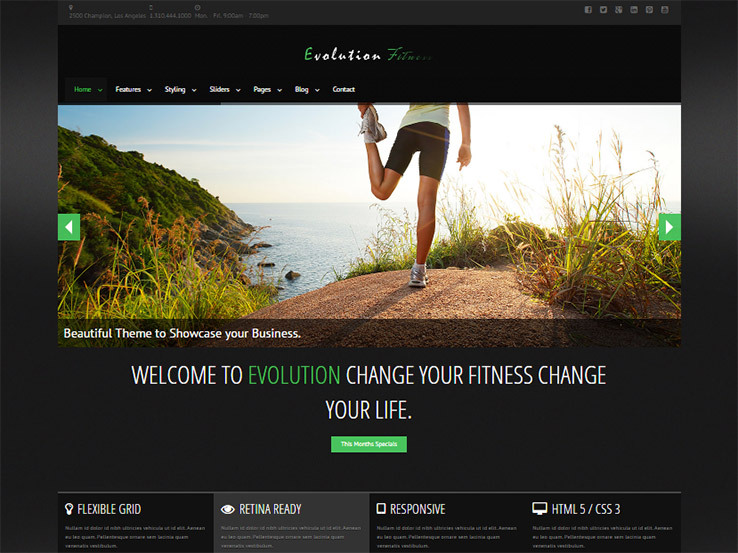 The Evolution Fitness theme is a great theme with responsive elements. It’s sold through the ThemeForest marketplace and it has stunning and modern graphics and designs. The theme provides two premium plugins that you would generally have to pay for. The first is called Revolution Slider, which turns your images into beautiful slideshows and allows you to add beautiful animation effects and text overlays. 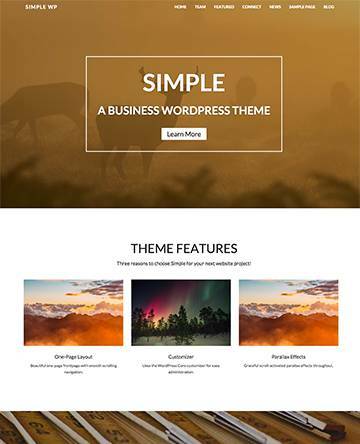 The LayerSlider plugin is another slider option that comes with the theme for free. Choose to use one or both for the ultimate slideshow design. Retina ready icons are included with the Evolution Fitness theme as well, allowing you to add an extra visual appeal to various sections of your website. A pricing table is included for fitness clubs and various shortcodes are packed into the theme which make it easy to add buttons, tabs, and other elements that you would generally have to code yourself. Various page layouts are offered with the theme. 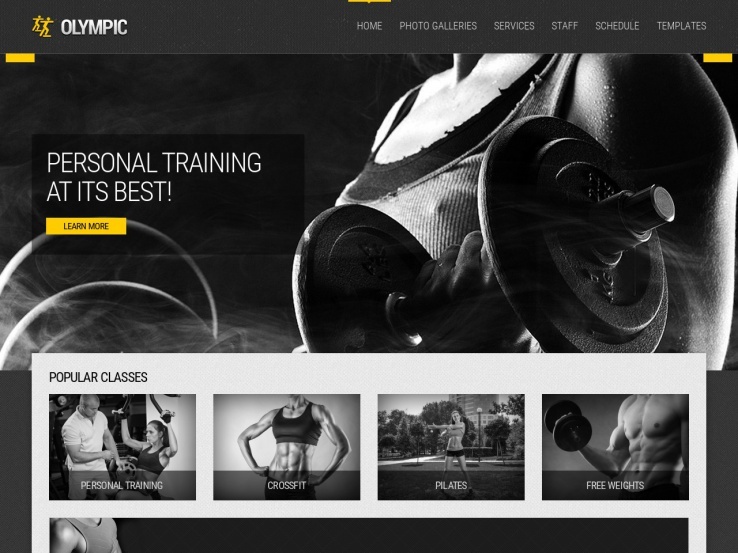 Use the portfolio layout to create a stunning gallery of your fitness club. Answer most common questions with an FAQ page. The Evolution Fitness theme has a full blog as well, allowing you to share fitness tips and videos with your members. Feel free to feature images and biographies of your entire staff and its trainers. This gives your fitness facility a more personal touch, and it lets you give credit to the people who are working for you. Along with membership options, payment connections, and more, the Evolution Fitness theme is a great choice for any fitness website. 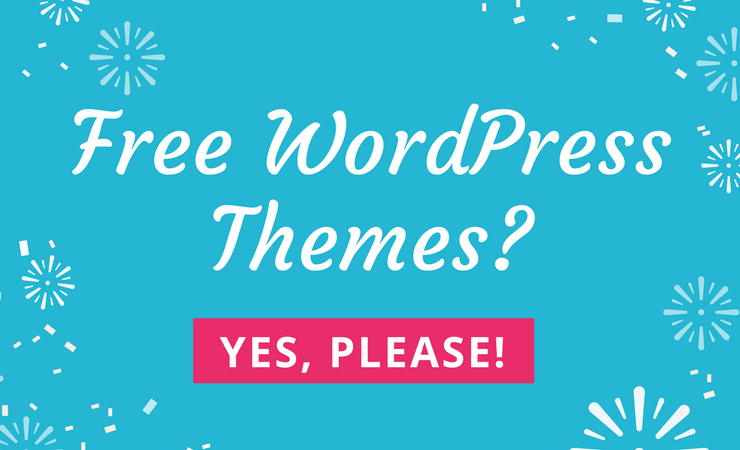 The Beauty theme is one of our favorite themes for a few reasons. 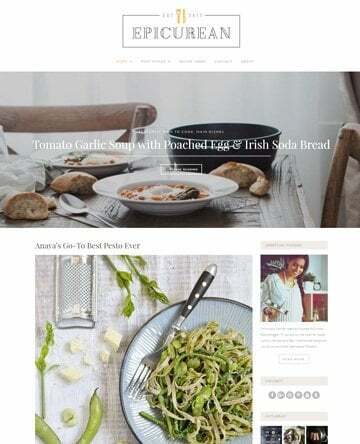 The theme has several layouts to choose from and it can be used for a fitness, beauty or a health blog. The mobile friendly layout looks great on just about all devices and the Visual Composer plugin on the backend ensures that you can customize the layout completely without ever touching a single line of code. The online booking area is essential for bringing in new clients while the events calendar makes it easy to showcase special events and promotions. As with many of the themes on this list, the Beauty theme is translation-ready. 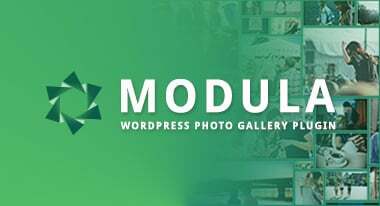 The Woocommerce compatibility is essential if you want to sell your own products and over 27 gallery styles make it easy to create unique and interesting galleries featuring your facility or recent events. The one click installer allows you to quickly set up your website so you can launch as quickly as possible. 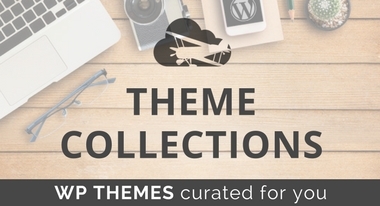 This theme has everything you need to create a stunning online presence. This is a great collection of gym and fitness themes. I am happy you found it useful! Hi Arpitha,\n You might want to check out Fitness Lite. Let us know if anyone else has a suggestion. Hi Vick, thanks for the feedback on Fitness, what are your favorite features of this theme?